He would eviscerate environmental regulation and encourage plunder by oil and gas interests. As he seeks the support of undecided voters in key swing states, Mitt Romney is portraying himself as a centrist at heart—not as the “severely conservative Republican” he said he was during the hard-fought GOP primaries. This kinder, gentler Romney was very much on display in his televised debates with President Obama. But a close examination of his energy plan, released on August 23, reveals no such moderation; rather, it is a blueprint for the systematic plunder of America’s farm and wilderness areas, coupled with a neocolonial invasion of Canada and Mexico. The true content of the Romney plan, titled “Energy Independence,” is not easily deciphered, as it is buried in lofty rhetoric about North American energy independence and the creation of millions of high-paying jobs. “I have a vision for an America that is an energy superpower, rapidly increasing our own production and partnering with our allies Canada and Mexico to achieve energy independence on this continent,” Romney declared. Read between the lines, however, and the predatory nature of his vision becomes evident. Essentially, the plan is intended to remove most impediments to the exploitation by US energy firms of untapped oil, gas and coal fields in the United States, Canada and Mexico, regardless of the consequences for national health, safety or the environment. In particular, the plan has five key objectives: eliminating federal oversight of oil and gas drilling on federal lands; eviscerating all environmental restraints on domestic oil, gas and coal operations; eliminating curbs on drilling in waters off Florida and the east and west coasts of the United States; removing all obstacles to the importation of Canadian tar sands; and creating an energy consortium with Canada and Mexico allowing for increased US corporate involvement in—and control over—their oil and gas production. In presenting these proposals, Romney tends to portray them as necessary reforms of current practice rather than as the radical departures they truly represent. For example, in pressing his number one objective—eliminating federal control over extracting fossil fuels on federal lands—he implies that his primary motivation is to speed up the permitting process and eliminate unnecessary paperwork. “States have crafted highly efficient and effective permitting and regulatory programs that address state-specific needs,” he declared. Under his plan, these state-level regulatory processes “will be deemed to satisfy all requirements of federal law” within the boundaries of a given state, thereby eliminating the need for federal regulatory bodies. Clearly, any move to eliminate the federal government’s role in overseeing oil and gas drilling on federal lands is bound to result in a greater risk of environmental catastrophe, as it will become impossible to adopt uniform standards for air and water protection, health and safety measures, wildlife protection and so on. Some states may insist on tough standards—New York, for example, has yet to approve fracking out of concern for the safety of its water supplies—but others are likely to prove far more lenient, allowing poorly regulated drilling operations with a high risk of environmental disaster. If approved, the Romney plan would prove a bonanza for lobbyists, who would no doubt descend on state capitals promising mammoth campaign contributions (mammoth, at least, by state election standards) to those legislators willing to do their bidding. A very similar picture arises in Romney’s proposal for regulatory reform. At first it appears he’s merely calling for the elimination of unnecessary paperwork: “Overregulation, permitting delays, endless reviews, and senseless litigation interfere with all forms of energy production”; hence, “modernizing” these regulations and processes “is crucial to ensuring that the nation can develop its resources safely and efficiently.” But simplifying paperwork is not Romney’s principal concern; as the plan intimates, his overriding goal is to obliterate all the environmental regulations that have been embedded in American law since the Santa Barbara oil spill of 1969—a major coastal disaster that helped solidify public support for the National Environmental Policy Act and other landmark statutes. Romney doesn’t deny the need for some environmental protections—at least in his public utterances—but he insists that energy extraction must take precedence over the environment (and everything else) in his drive to make the United States an “energy superpower.” As Romney puts it: “Regulations should be carefully crafted to support rather than impede development.” This means, he indicates, adopting regulatory reforms aimed at loosening environmental restrictions that are hobbling domestic coal production and offshore oil and natural gas drilling. Offshore oil drilling has its own chapter in the Romney energy plan, as it is seen as one of the few ways of significantly boosting US production and thereby promoting the long-sought goal of “energy independence.” At present, drilling in the US Outer Continental Shelf is limited to the central and western Gulf of Mexico and to the Beaufort and Chukchi seas off Alaska. As a result of the Santa Barbara spill, Congress and most of the coastal states have opposed drilling in other sections of the OCS, although some in Virginia favor drilling off their state’s coast. Now Romney seeks to initiate a process leading to the elimination of all curbs on offshore drilling. Under Romney’s plan, waters off Virginia and the Carolinas would be opened to drilling during an initial five-year OCS development program, while other areas would be thoroughly explored and a process begun that would lead to drilling in the years that follow. All this would take place in an environment of what Romney calls “regulatory reform,” in which the auctioning of drilling permits would be speeded up and federal oversight diminished. The net result would be to turn the clock back to 1969, before the Santa Barbara spill and the adoption of this nation’s bedrock environmental laws, and to vastly increase the danger of environmental disasters like the 2010 Deepwater Horizon explosion and oil spill in the Gulf of Mexico—an event attributed, among other things, to a lack of government oversight. For Canada, Romney’s plan for increased US participation in the energy field is unlikely to spark much official resistance so long as Stephen Harper, a Conservative, retains his position as prime minister. Harper is an ardent supporter of tar sands development and thus would be happy to see increased US investment in the Athabasca tar fields (so long as it generates jobs and income for his fellow Albertans). But Mexico is another matter altogether. The expropriation of Mexico’s oil industry by President Lázaro Cárdenas on March 18, 1938, was one of the defining events in modern Mexican history; it is still recognized as an important civic holiday. State ownership of the nation’s petroleum patrimony is embedded in the Constitution, and control over its production is entrusted exclusively to the state oil company, Petróleos Mexicanos (Pemex). Although it is true that some Mexican politicians favor legislation allowing a greater role for foreign firms to serve as technical service providers to Pemex in developing the country’s offshore oil fields, any attempt to implement Romney’s plan promoting US involvement in shaping Mexico’s regulatory practices—as well as a significant US corporate role in the country’s oil and gas industry—would be viewed by many Mexicans as a form of neocolonialism, and so would trigger a powerful backlash. Romney says his plan is intended to benefit the American middle class by boosting domestic energy supplies and generating new jobs. 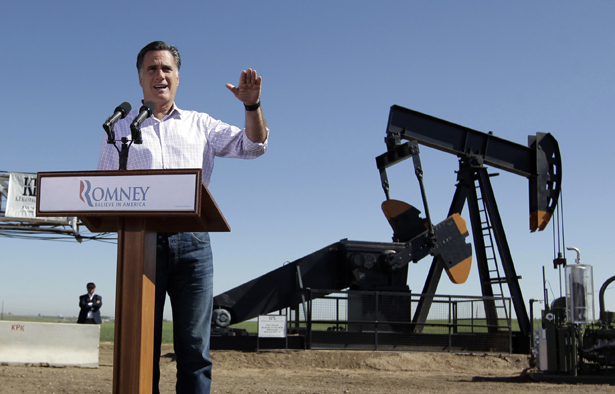 No doubt an increase in domestic oil and gas production would benefit some poor farmers who lease their land to the drillers, and it would also generate some additional jobs for oil workers and those who cater to their needs, but it is unlikely to generate the “millions” of new jobs that Romney has promised. For each new job created, moreover, an equal (or greater) number of people will suffer from the destruction of the natural habitat on which they rely, one way or another, for their lives or their livelihoods. The only real beneficiaries of Romney’s plan, of course, will be the giant energy firms and their principal shareholders—many of whom, like Charles and David Koch, rank among Romney’s top campaign contributors. If Romney wins the election and pushes through his energy plan, they’ll be given free rein to plunder the hemisphere’s resources without regard for the consequences. In our October 29 issue, Ken Ward Jr. described how both Obama and Romney pander to a coal industry they know is dirty—and on the decline.